Country coordinators from Bangladesh, Brazil, Ecuador, Ghana, Indonesia, Malawi, Myanmar, Peru, Philippines, Papua New Guinea, Solomon Islands, Tanzania and Zambia attended a civil registration and vital statistics (CRVS) boot camp organised by Bloomberg Data for Health (BD4H) partners the University of Melbourne and Vital Strategies. Held over three days from 24 October at the University of Melbourne, the boot camp provided country coordinators with a broad overview of the importance of CRVS systems in guiding policy and improving population health, and developed their knowledge, skills and confidence to run activities in country. It was the first time country coordinators had been assembled in the one place and it gave them the opportunity to share their success stories, common challenges and possible solutions. Country coordinator Dr Ninkama Moiya travelled from the highlands of Papua New Guinea (PNG) to attend the boot camp and appreciated the opportunity to meet in person the people he had only communicated with by email previously. “I found the presentations to be informative and educational and came away from the boot camp with a thorough understanding of the status of each country in implementing their CRVS programs. I also enjoyed the robust discussions by participants,” said Dr Moiya. In PNG, Dr Moiya explained, the major infectious diseases concerns are pneumonia and gastroenteritis conditions in children and malaria and tuberculosis in all ages. Other major health concerns include the increase in diabetes and degenerative cardiovascular diseases as people’s diets move from traditional to more processed foods. “In addition, pregnancy-related deaths in women and accidents caused by use and abuse of alcohol are also troubling health statistics. To combat these public health concerns, better collaboration is needed between the different health and government departments in PNG,” said Dr Moiya. Ghana’s country coordinator Dr Fidelia Dake was a panellist at the boot camp. She explained that while Ghana continues to grapple with infectious diseases, non-communicable diseases and their risk factors are also on the rise. “On a positive note, Ghana has undertaken a number of activities to improve its CRVS system in recent years. A comprehensive assessment was conducted in 2014 to assess the weaknesses and the challenges in the system. In response, a national CRVS strategic plan has been developed and some proposed interventions are now being implemented as part of the BD4H initiative,” said Dr Dake. She said that one of the challenges in improving CRVS in Ghana is the delay that occurs with the passive system of registration that relies on families to notify agencies about vital events. “For me, one of the main highlights of the boot camp was the vast experience on verbal autopsy from the different countries involved in the initiative. With Ghana being in the initial phase of implementing a community-based verbal autopsy, the wealth of knowledge shared by other country coordinators was very insightful,” said Dr Dake. 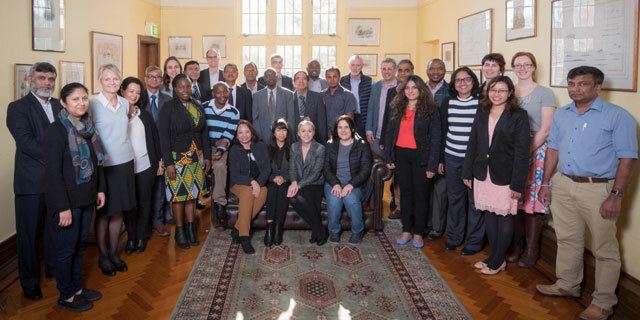 The University of Melbourne’s Bloomberg Data for Health Technical Officer Nicola Richards enjoyed seeing presentations from different country coordinators and the conversations they provoked. “It was great to learn about the various CRVS activities occurring in each country, and the many early wins. For example, seeing how the use of enterprise architecture (business process mapping) has really helped each country to identify the weak areas within their CRVS systems, and map out a way to move forward,” said Mrs Richards. Dr Philip Setel and colleagues from BD4H partner organisation Vital Strategies were also in attendance at the boot camp. Vital Strategies retains and manages the country coordinators and is the implementation lead on the BD4H initiative, with a particular focus on data health. “Having these three days here in Melbourne has provided an opportunity for country coordinators to round out their knowledge of and grounding in the basic building blocks of CRVS systems and the improvement interventions we are supporting in country,” said Dr Setel.